Written by Michele Zack, author of Altadena: Between Wilderness and City, for the commemoritve booklet produced for the community’s 125th birthday, Nov. 3, 2012. Altadena is an unincorporated community of Los Angeles County, next to and within the foothills of the San Gabriel Mountains. It is bounded on three sides by wilderness (the Arroyo Seco, Angeles National Forest, and Eaton Canyon), and on the south by the city of Pasadena. Throughout its history and up until today, as Altadena celebrates its 125th year, this distinct geography has nurtured an independent spirit and given the community a close-to-nature feel. Citizens here have consistently resisted annexation to Pasadena (although that city has taken 46 “bites” of it over the years, seeking tax revenues), and voted down incorporating as a city. Altadenans prefer a looser political structure that still manages to foster an unmistakable identity. Altadena’s American roots date to the period immediately following statehood, when settlers began tapping water sources in its canyons. Benjamin Eaton began developing water systems for Don Benito Wilson and Dr. John Griffin, who purchased the 14,000 acre San Pasqual Rancho (eventually developed into Pasadena, South Pasadena, Altadena, and parts of other adjacent communities) from Manuel Garfias in 1858. Eaton was soon successfully growing grapes with little water just beneath the foothills, and also citrus, which he proved could thrive at higher altitudes than previously believed. Pasadena pioneers, mainly from the Midwest, were led by Eaton and others to buy the central 2,400 acres of the Rancho San Pasqual from Wilson and Griffin in 1873. They began building a temperance community of educated, well-heeled citizens who sought to create an island of beauty, civilization, and health in the west. Many early residents suffered from tuberculosis and other illness and injury suffered during the Civil War, and many were Union vets. The ranchers and farmers a few miles to the north, however, resisted Pasadena’s attempt to include the highland area within the new city’s limits in 1886, when it incorporated in the middle of the great Southern California boom. Most grew wine grapes and wanted no interference from prohibition-minded folks. 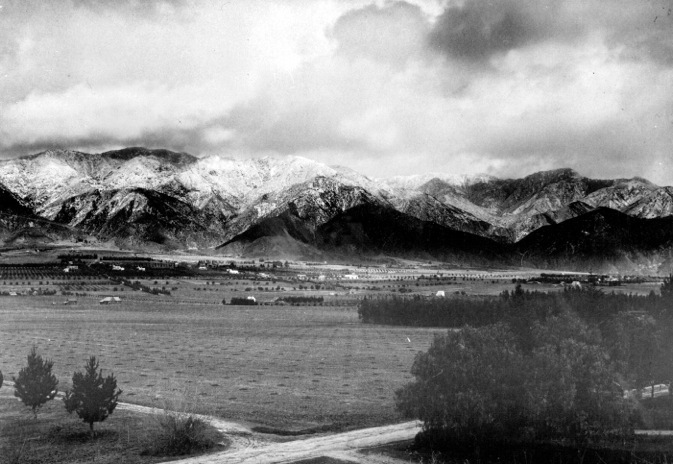 In this period Los Angeles County was the state’s largest wine producer, helped along by Altadena’s abundant harvest. Altadena was opened as a subdivision in late 1887 by John and Fred Woodbury from Marshalltown, Iowa. The Woodburys envisioned a millionaires’ rural suburb north of busy Pasadena, hoping to add to the wealthy class already gathering here, including Col. Charles Greene and Andrew McNally. Their timing was off, the real estate bubble burst in 1888, and the region was thrown into an economic panic that grew worse as it merged into a great national depression lasting through much of the 1890s. A bright spot in this period was the development of Thaddeus Lowe’s elegant mountain railway, which created a connection from Los Angeles though Pasadena and up to Altadena and beyond, to the many hotels and camps in the mountains. There, temperance was not an issue. From this era, the 1890s through the 1920’s, ranchers and residents continued slowly buying up Altadena land, growing grapes, and expanding into oranges, olives, walnuts — and in the early 20th century, dates, avocados, and commercial fruit and ornamental plant nurseries. Business magnates also came, mainly from Chicago and other midwestern cities, attracted by climate, rural ambiance, and the delights of nearby Pasadena. They built many grand winter and retirement homes, gradually moving the center of wealth from Mariposa Street east toward Eaton Canyon in the ‘teens and ‘twenties. Despite the grandeur of its estates, Altadena also attracted regular folks, fewer of them farmers as time went on. Excellent public transportation lines made jobs in Pasadena and Los Angeles easily accessible. Somehow, Altadena retained its rustic character and rural flavor through the 1930s, when people continued to arrive, and into the 1940s. A cadre artists, writers, and bohemians joined the population of blue and white collar workers and millionaires. Economic growth and GI benefits fueled the largest expansion of the middle class in U.S. history following World War II. This included rising rates of home ownership; a huge building boom ate up most of Altadena’s remaining open land and turned it into housing for the newly upwardly mobile. It consisted of infill around estates in Central Altadena, and new tracts built on the west side — where farming had lasted longest because of excellent water sources. In the 1940s and 50s, Altadena reached its present day population in the 40,000s (peaking at 46,000 in the early 1950s, and settling down to 43,000 today). About 96% were white. This time of an expanding economy, modernization, business growth, and community building took place during the Cold War, when ideological battles and fear of communism played out across America and around the world. Altadena’s present day diversity came into being largely during the tumult of social change in the 1960s and 70s. The Civil Rights movement, protests against the Vietnam War, the rising youth culture, and other national issues of the day played out locally in lawsuits over school integration, neighborhoods carved apart by new freeways, and redevelopment conflicts in Pasadena. All of these causes, along with a thickening layer of smog piling up against the mountains, prompted half of Altadena’s population to leave in a flurry of white flight. New residents were mainly people of color. In a shifting mosaic of ethnic diversity over the past 40 to 50 years, virtually every Altadena neighborhood has become mixed racially, although the west side remains more diverse and working class. The community’s many groups are now reflected in civic life, making Altadena one of the most integrated communities in Southern California.